No fried chicken – waaaaah! The long haul home has begun. We rose at 5.30am for a 7.30am flight to New York (via Charlotte, North Carolina). If we make the connecting flight – deep breaths – its 14 hours to Seoul, a two-hour wait, then 10 hours to Sydney. Our last day of holiday kicked off with an enervating walk down the “dangerous” part of Meeting Street to a middle-of-nowhere restaurant called Taco Boy for brunch. Everyone tucked into margaritas and tacos as you do at 11am on a Sunday morning (???). Then our new best friend Jane the cab driver arrived to pick us up and relieve us of another chunk of the kids’ inheritance, taking us to Boone Hall Plantation for the afternoon. They carefully don’t reveal in the brochure that Boone Hall was torn down in the 1930s and rebuilt. So we toured a “historic” home from the same era as the first house I bought in Petersham. But it redeemed itself with its colorful Hollywood history. 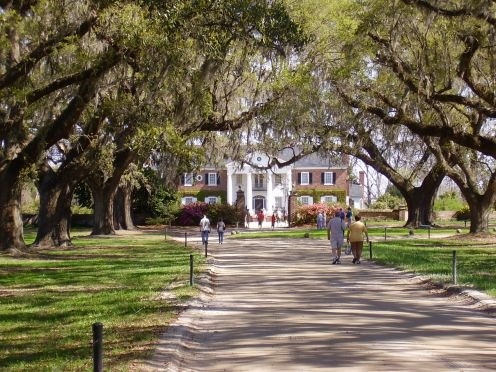 Boone Hall is where Patrick Swayze filmed the mini-series North & South. It’s where Halle Berry filmed the mini-series Queenie. And, most exciting of all, Blake Lively and Ryan Reynolds exchanged wedding vows on its front porch last year, while Martha Stewart catered a reception on the dock. Boone Hall’s slave cottages were still standing and they kept making me cry as we toured them. Each cottage had an audio presentation of a different and terrible aspect of slavery. Forced to work 12 hours a day, savagely beaten, not given enough food, only getting a blanket every three years to keep themselves warm, being regarded as possessions not human beings, that sort of thing. Afterwards, Jane the cab driver drove us to the Charleston Market for souvenirs before we headed to a bar for a few drinks, then to The Makintosh restaurant for dinner. Husband and I had a bit of a stoush because The Makintosh served groovy modern food and I wanted Southern fried chicken and gravy. I backed down poutily and ordered a plate of pork nibbles as revenge. I’m still a bit sad my only Southern fried chicken experience was a taco. In our usual holiday form, we were in bed – asleep – before 9pm. Old age is a terrible thing. Jane was in the lobby waiting to take us to the airport at 6am. Jane’s a hoot, actually. If you’re ever heading to Charleston, let me know and I’ll give you her number. She regaled us with stories about her grandmother on the way to the airport. Grannie is 107 and still lives on her own, tending her garden, making blueberry dumplings from her blueberry bushes, calling Jane whenever she’s making her favourite “biscuits” and gravy (more like scones) so she can feed her up. Catch you in a few days, there’s a copy of Garden & Gun calling my name … The magazine that’s the “soul of the south”. PS Do you come from long-living stock? My nan and great-grandmother both made it to 90, but they weren’t tending blueberry bushes in their twilight years. You made me laugh at yr comment on Boon Hill being old as yr place in Petersham. And dag nabit (spelling?) you didn’t get yr fried chicken. I’d b pouting too. I hunt out authenticity, even if it is kitsch, each time I travel. At Seoul Airport, but couldn’t face another bibimbap, so had a burger. Very inauthentic of me!